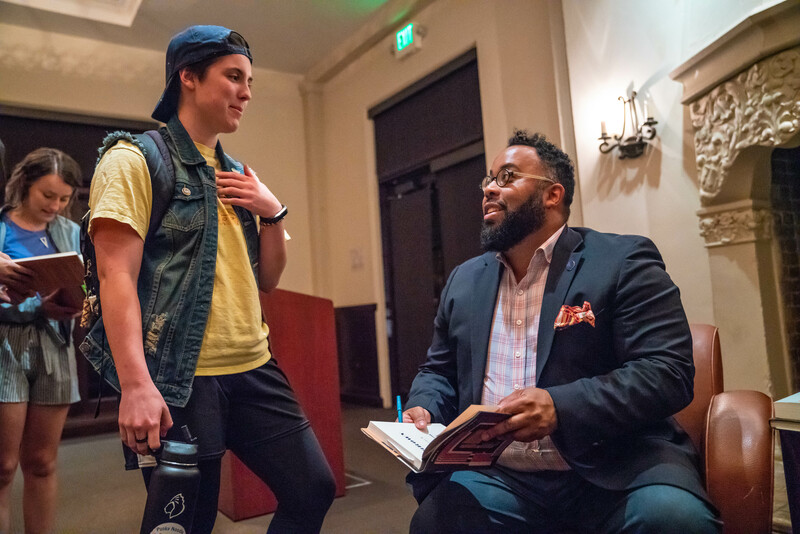 A standing room–only crowd of students, faculty, staff, and guests filled Hagerty Lounge in De La Salle Hall last Wednesday evening to meet with award-winning author and poet Kevin Young. Young’s appearance kicked off the 2018–19 MFA Creative Writing and Reading series that welcomes authors from around the world to visit Saint Mary’s for readings, conversation, and community engagement. Kevin Young is the director of the Schomburg Center for Research in Black Culture, newly named a National Historic Landmark; and poetry editor of The New Yorker. He is the author of 13 books of poetry and prose, most recently Brown (2018); Blue Laws: Selected & Uncollected Poems 1995–2015 (Knopf, 2016), longlisted for the National Book Award; and Book of Hours (Knopf, 2014), a finalist for the Kingsley Tufts Poetry Award and winner of the Lenore Marshall Prize for Poetry from the Academy of American Poets. His collection Jelly Roll: a blues (Knopf, 2003) was a finalist for both the National Book Award and the Los Angeles Times Book Prize. Young revealed more about growing up in the South and how attending a creative writing class during the summer when he was 12 years old changed his life. “I wrote little poems when I was a kid that my mom would type up, and I still have some of those, but when I started writing ‘poem poems,’ I found I couldn’t stop,” he said. Young was the guest of honor at an informal dinner attended by MFA faculty, staff, students, and board members, where he shared stories from his childhood on how his life was influenced by older Southern family members, teachers, and mentors who recognized his gift of storytelling well before he did. “I took a youth writing class from professor Tom April, and he became my childhood mentor,” said Young. “He helped me discover that I had a poet’s temperament and that I wanted my words to not just be right, but to sound right. We are still friends to this day,” added Young.